Initial lymphatics have a large diameter (20 to 70 mm) and an irregular luminal shape. They start in the interstitial spaces as plexus or blind-opening tubes, demonstrable with only few exceptions in all parts of the body. Valvelike structures and trabecules can divide the vascular lumen in a labyrinthine pattern. The occurrence of initial lymphatics is, as a rule, at the utmost distance from blood capillaries. In organs with an epithelium, initial lymphatics are located under the blood capillary network. Only precollectors, collectors, and trunci run parallel to blood vessels. Table I The Human Lymph Vessel System. The inner surface of initial lymphatics is lined by a single layer of endothelial cells. With the exception of the perinuclear zone the cytoplasm is very thin, from 0.1 to 1.2 mm. Those thin areas are zones with very small distances for the diffusion or the transport of molecules. In the nuclear zone the cell is 0.9 up to 1.4 mm and the cell diameters are about 60 x 30 mm. Cell density is 500 per mm2 in an area of 1 mm2. The cell circumference is similar to an oak leaf and it has contact structures to four to eight neighboring cells (Figure 1). The diameter of the inlets is about 4 to 8 mm. Neighboring cells overlap each other and are connected with zonulae adherentes. The peripheral cytoplasm is electron-dense and partially interrupted by pores. Sometimes endothelial trabecular structures running in the lumen connect with another endothelial cell or produce structures like incomplete valves. In the lumen of initial lymphatics one can find fine granular material (coagulated lymph), in transmission electron microscope (TEM) a gray flocky material. Figure 2 Initial lymphatic endothelium in SEM. N = nucleus, CB = cell border, OJ = open-junction formation. Triton-X-100 method. phosphatase activity exists. Often merging zones of the vesicles with the plasmalemma are visible (Figure 3), both up to the luminal or abluminal direction, with openings from 50 to 150 nm. These vesicles are transport systems into the cell, out of the cell, and through the cell (endocytosis, transcyto-sis, and exocytosis). 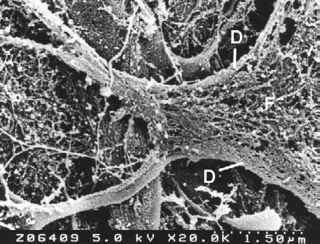 Great numbers of fine filaments are typical for the initial endothelium cell. The diameters are about 6 nm; sometimes they are dispersed, and sometimes aggregated to bundles, then running mostly in the longitudinal axis of the cell. The length of the filaments is from one to several micrometers. Following treatment with Triton X-100, elements of the cytoskeleton are visible in SEM. Above the nucleus, its texture is relatively compact with a mesh about 75 nm wide. In contrast, in the peripheral zone it is wider with meshes of about 100 to 750nm. Often bundles of filaments are running along the cell border (Figure 4). This dense peripheral band (DPB) can be demonstrated in TEM and SEM, clearly visible after application of the Triton X-100 method. In end-othelial cells of blood venules Wong and Gottlieb  determined actin, myosin, tropomyosin, a-actinin, and vin-culin as components of the DPB. Thus, it is able to contract, and it is likely that the DPB controls cell shape. 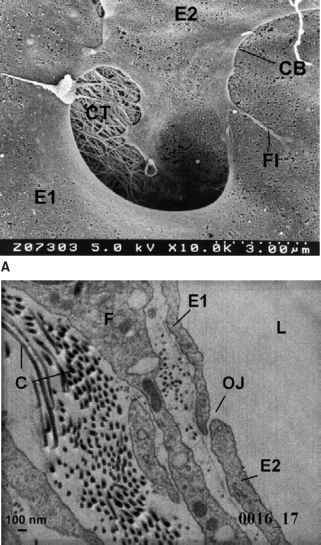 Figure 3 Vesicles (V) and invaginations (I) of initial lymphatic endothelium (E) in TEM. F, fibrocyte; C, collagenous fibers. Figure 5 Luminal surface of initial lymphatic endothelium (E) in SEM. 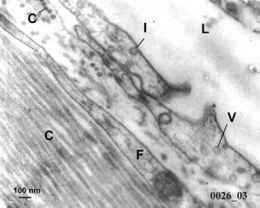 I, invagination; OJ, open-junction formations; M, microvilli; CB, cell border. Figure 4 Cytoskeleton of initial lymphatic endothelium in SEM following treatment with Triton X-100. D, dense peripheral band; F, filaments of the cytoskeleton. On the surface of the initial endothelium cells partly some microvilli, microridges, and microfolds are visible. Numerous invaginations are signs for active transport phenomena. Fenestrations of the cells could not be demonstrated (Figure 5). Otherwise the surface is relatively smooth, covered with a so-called glycocalyx like every cell. It consists of glycoprotein, glycolipids, free polysaccharides, and glycosaminoglycans as part of the cell membrane. This glycocalyx has been the subject of research in the past 10 years as researchers have tried to find specific markers for the lymphatic endothelium to be able to demonstrate the distribution of the lymphatic vessel system in healthy and pathologically altered organs. Table II Markers for Enzyme- and Immunohistochemical Characteristics of the Initial Lymphatic Endothelium. + and —: Valuation for usefulness and distinctness. Different enzyme- and immunohistochemical methods have been used to describe the numerous more or less specific characteristics, but only few are typical and selective for the initial lymphatic endothelium to differentiate it from the blood vessel system (Table II). As the lymphatic sinus lacks a continuous basement membrane, immunohistochemistry for extracellular matrix components has also been applied to distinguish them from capillaries of the blood vascular system. Since about 1995, antibodies have been established for a selective immunohistochemical characterization of lymphatics. At present three antibodies seem to be best suitable for detecting lymphatic vessels in human: anti-podoplanin, a polyclonal mouse IgG antibody against a 43-kDa glycoprotein of the lymphatic endothelial cell membrane; anti-desmoplakin-1 2.17, a monoclonal mouse-IgG that binds a 220-kDa protein of the complexes adherentes of the lymphatic endothelia and other epithelial structures; and LYVE-1, a lymph specific receptor for hyaluronan, homolog to the CD 44 glycoprotein. Most studies describe the isolation of cells from mesen-teric collecting or thoracic ducts, that is, they originate from large vessels. To date, isolation of endothelial cells from initial sinus has failed. Studies of lymph angiogenesis from a cultured large-vessel lymphatic endothelium show spontaneous reorganization into a branching and anastomosing network of capillary-like tubes in planar cultures of bovine and ovine lymphatic endothelium cells. The lumina of such tubes contained extracellular matrix and cell debris. Spontaneous sprouting has been observed from aggregates of cultured lymphatic endothelial cells in three-dimensional collagen gels as well. The cell branches of the oak leaf-like initial lymphatic endothelium cell clearly overlap each other. Partly they form closed-junction formations, partly open-junction formations, acting as inlet valves for the uptake of tissue fluids and for reflux prevention of the lymphatic fluid respectively. 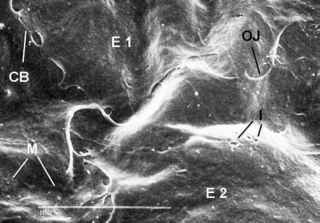 In closed-junction formations, the endothelial cells of the initial lymphatics were connected with zonulae adherentes, electron-dense structures in TEM. The silver deposits of the silver method correlate with these junction structures. Zonulae adherentes, on the one hand, serve as anchoring structures for the dense peripheral band (DPB) of the cytoskeleton and, on the other hand, they are the structural basis for the contact between neighboring cells. The intercellular cleft is about 15 nm wide. In the cell membrane there exist transmembrane molecules (E-cadherin and N-cadherin). The neighboring cadherins are connected to each other in the intercellular space by means of calcium ions (Ca2+). Within the cell, transmembrane molecules are bound to protein linkers on the actin filaments of the DPB. Figure 6 Closed-junction formations. E, endothelial cell; ZA, zonula adherens. TEM. (A) Elementary form. (B) Simple overlap. (C) Single fold. common are closed-junction formations with a multifold system of cell border interdigitations. Beneath the zonulae adherentes the cells of the initial lymphatics typically possess inlets where neighboring cells only overlap one another in a distance of about 0.2 up to 1.4 mm, thus forming inlet valves (Figure 7). The diameter of an open-junction formation ranges from 3 to 6 mm. Each cell possesses up to 15 inlet valves in common with its neighbor. So the number of open-junction formations is about 3,750/mm2. On the abluminal surface anchoring filaments connect the endothelium cell with the filament system of the surrounding tissue via the sparse basement membrane. In the region of the cell borders spaces or caveolae occur without or with an opening toward either the luminal or the abluminal surface. Within these caveolae one can find a clear fluid, membrane-surrounded vesicles, condensed material, and cell detritus or whole cells such as eosinophils. So the caveolae can be developed by migration of cells from the interstitium into the lymphatics, and/or they are spaces for the removal and destruction of older lymph cells due to the initial lymphatics as a part of the reticular endothelial system. A further specialty of the initial lymphatics is the occurrence of open-interface formations. These are specific structures arising from initial lymphatics, branching and tapering into the surrounding connective tissue, presumably acting as pressure relief valves. Sometimes sproutlike formations are visible, consisting of spindle-shaped endothelial cells in the beginning region of initial lymphatics. They are 3 mm in width and 12 to 14 mm in length. In this region a basement membrane is not demonstrable. This arrangement may be able to build up new open interfaces or new initial lymphatics within a short time under different conditions. Figure 7 Open-junction formation. E, endothelial cell; ZA, zonula adherens; CB, Cell border; FI, filopodium; CT, connective tissue; L, lumen; OJ, open-junction formation; F, fibrocyte. TEM. (A) Stretched open-junction formation, due to perfusion pressure. SEM. (B) Normal situation. TEM. In contrast to blood capillaries, the basement membrane of the initial lymphatics is sparse and reduced to a few reticular fibers. Interruptions in the basement membrane and their absence over long distances can be demonstrated. In SEM, on the abluminal surface of initial lymphatics a fine network of woven fibers is visible, allowing particles to pass this membrane. Periendothelial cells cannot be demonstrated (Figure 8). Figure 8 Basement membrane (BM) and connective tissue (CT) at the backside of an initial lymphatic endothelium cell. SEM. endothelium, there are anchoring filaments with a diameter of 50 to 60 nm, radiating over a distance of 10 mm in the connective tissue around the initial lymphatic. 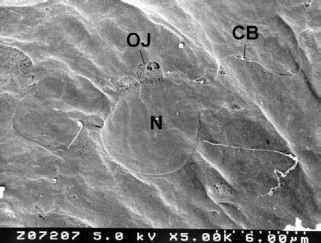 Such anchoring filaments obviously consist of elastic and collagenous components and have a diameter of about 10 nm. The fixation of the anchoring filaments at the outer surface of the initial lymphatics is performed with the aid of adhesion molecules, such as kinase, vinculin, talin, and b-actin. Thus, mechanical signals of the interstitium could be transformed into biochemical signals within the endothelial cell. This elastic fiber system could probably generate intraendothelial stimuli for adaptation, for example in modifying the number of open-junction formations. 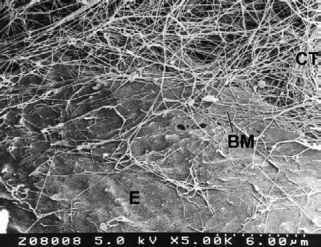 In SEM the filaments of the connective tissue around the initial lymphatic build up an irregular network. 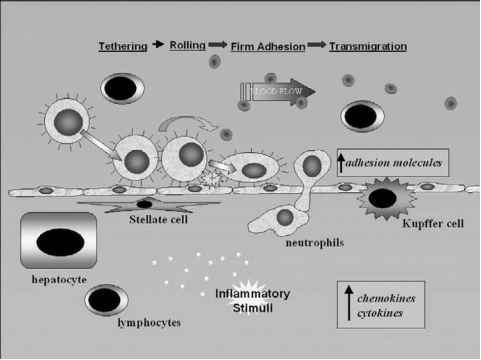 They can be aggregated to bundles along the vessel wall and extend in some distance between collagenous bundles and fibrocytes of the connective tissue. Elastic fibers in the neighborhood of the initial lymphatics form longitudinally orientated networks mainly in a distance of 5 mm, whereas blood vessels do not have such elastic networks. percent is bound by the gelatinous phase of the extracellular matrix. So in TEM and SEM regular spaces are visible, lined only by a net of fibers or incompletely lined with widespread endothelium-like fibrocytes. 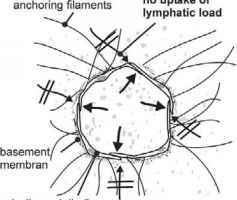 within these tissue channels the so-called "lymphatic load" is transported toward the initial lymphatics with their open-junction and partly open-interface formations. The open-junction formations build up a free transport path for substances from the tissue spaces directly into the initial lymphatic, guaranteeing the quick removal of the lymphatic load under normal conditions. of the surface of an undilated initial lymphatic, 2.3 percent is part of the inlet zones. Because of the close embedding in the fiber network of the connective tissue, in the case of an increasing lymphatic load the initial lymphatics are stretched in all directions by the transferred forces over the anchoring and collagenous fibers interwoven in the basement membrane. The resulting dilatation leads to a widening of the open-junction formations of the initial lymphatics. Under such physiological conditions, a better uptake of the lymphatic load results, because these structures prevent edema under normal conditions. 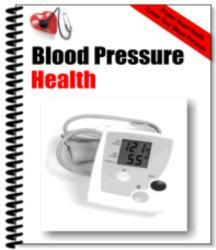 when the pressure within the initial lymphatic is higher than in the surrounding tissue, the open-junction formations act under normal conditions as a one-way system and the valves will close. The elastic fiber system around the lymphatics stores the energy during dilatation and restores this energy in the relaxation phase. So the lymph will be propelled in proximal direction and the cycle starts again (Figure 9). Lymph formation is a result not only of the number and function of open-junction formations but also of active transport phenomena. On both the luminal and abluminal surfaces of the initial lymphatic endothelium fine pores are visible, interpreted as vesicular uptake or delivery of substances. So a protein enrichment of the lymph with selectively, actively transported substances results. This leads to a higher protein concentration within the lymph, supporting the uptake of lymphatic load along the oncotic gradient. In all these processes ER, the Golgi-apparatus, and lysosomes are involved. The coated pits in TEM are responsible for the receptor-controlled endocytosis for the uptake of, for example, cholesterin, hormones, toxins, virus, carrier proteins, and antibodies. These functional properties of the lymphatic endothelium cell and the sparse basement membrane, the lack of pericytes, and all the other properties described make it clear that the initial lymphatics are not capillaries in the common sense. The term "capillary" should be applied only for the finest vessels of the blood vessel system, which possess totally different properties than the initial lymphatics or much better the "initial lymph sinus." So far, the endothelium of initial lymphatics is characterized as a flexible structure with the ability to respond to higher tissue fluid demands and the need of transporting more lymph, if necessary. Where are the initial lymphatics?